Regardless of your experience buying, selling and/or investing in real estate, sometimes stress can be a factor. We would never promise a completely stress-free experience, however, we can promise that we'll be right there with you to battle it out, to guide you through the ups and downs of the process; as partners, as friends and as trusted and experienced real estate professionals. Picking the right team matters, and we'd like to be a part of your team. MEET US FOR A COFFEE OR A DRINK AND LET'S CHAT! We're great at helping our clients buy, sell and invest in real estate. Our listings are updated regularly, however, due to the nature of the market, some properties are sold within days. Contact us if you'd like to receive the most up-to-date information. We had just helped our client purchase a new larger condo in Yorkville. It was pleasure to then sell her condo at Ideal Lofts! It sold in just one week for a lot more than the asking price! Older condos are amazing for clients looking for more square footage. Our amazing designer Jessica expertly staged this unit to appeal to those looking to transition from a house to a condo that didn't feel like they would be squished in. After multiple offers, 235 St. Clair was sold for much higher than the asking price! 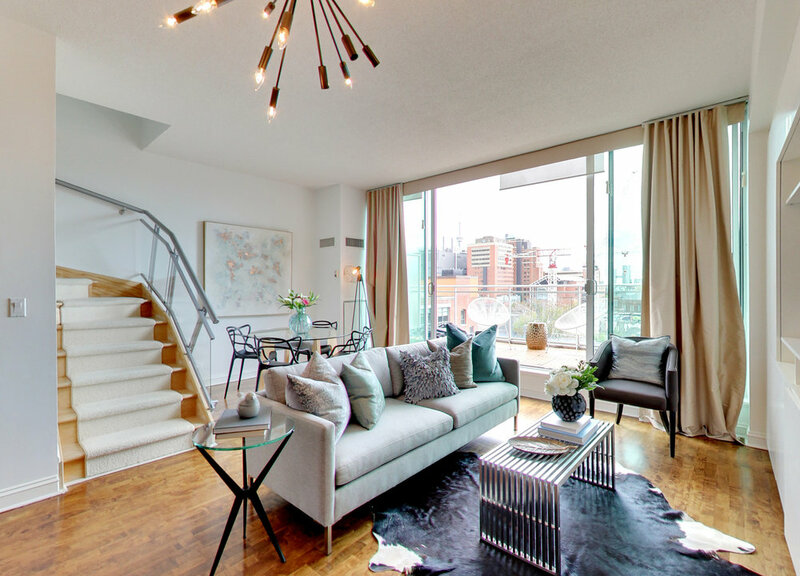 This modern luxury townhome on Roxton Road provided the owner with over 3000 square feet of open concept space, also expertly staged by our designer Jessica, to show at its’ best. Sign up with your email address to receive news and tips!